If rumors are true, details may be available for Dragon Age: Origins' first larger expansion pack. The first expansion packs for BioWare's Dragon Age: Origins, Warden's Keep and the Stone Prisoner (and likely the upcoming $5 Return to Ostagar), are great bite-sized snacks, but not really true expansions which tend to add a larger amount of content. If a post on Eurogamer.cz can be believed, information on BioWare's first big content pack for the game was leaked in an accidental early online listing. These details are only being translated by Google, but the basic premise of the expansion can still be deciphered. It's called The Awakening (or something similar) and will actually follow a new main character with a new origin story on a new campaign. It's expected to last around 15 hours, and will bring players to an as of yet unexplored region of the world. 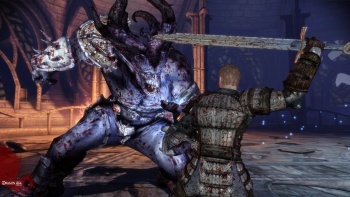 The article mentions that The Awakening will be priced at around 2/3 the cost of the original game, which would make it $40, with a release date of March 19, 2010. Take all of this with a grain of salt, or ten, as not a single iota of official information has come out of BioWare or EA on this yet. We do know that BioWare has a two-year plan for Dragon Age: Origins DLC, so it wouldn't be crazy to see a nice-sized content pack as early as March. An official announcement could be made in early January, which would mean very soon. Try not to get possessed by a sloth demon in the meantime.